How well do these compare to the chip and wire antennae? I find that the wire is better than chip. My UK supplier said that this trace is better than chip, I have not noticed any difference. No RF-way to solder on an antenna where there already is an antenna. Disrupts the impedance. There are XBee's with u.FL connectors so you can plug in a coax going to a variety of antennas. PCB antenna to me means antenna formed by copper traces on the XBee. That's what's talked about in the WRL-11215. 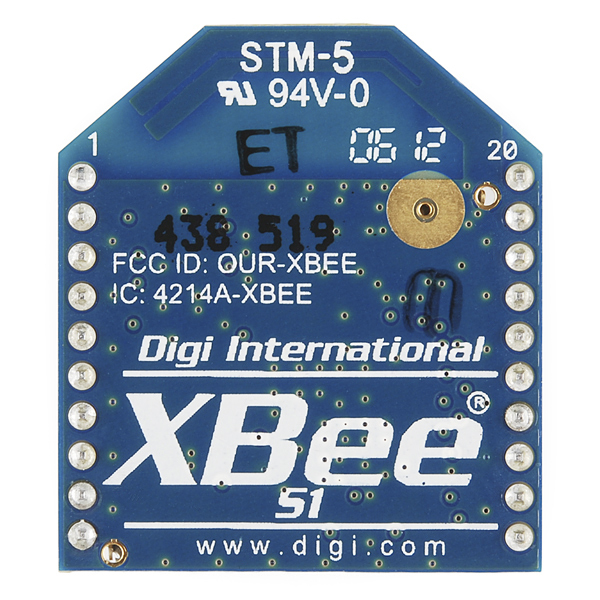 There is/was an XBee with a similar antenna, in the form of a (blue) silicon chip antenna that mounts on the PCB. That kind of chip antenna is widely used in WiFi and Bluetooth. The antenna has poor/negative gain and an irregular radiation pattern. The PCB trace antenna is likely very similar to the chip antenna, but less costly. The wire antenna, if you have the space, and if the XBee isn't inside a ferrous metal box, is the best choice. If in an aluminum box- you may be surprised as to how RF-transparent aluminum is, vs. steel. Transparent aluminum? Brings back memories of a Star Trek movie... In my experience, aluminum is a very effective RF shield. It is used in high power radios to isolate one section from another, for instance. However, if you have an enclosure with a cover which is poorly fitted, or one with too few screws to close the cover, it is possible that RF signals will be able to leak in/out. To check the shielding effects that aluminum has, put a cellphone into a die-cast aluminum enclosure which has no openings, and call the cellphone. You won't see a missed call displayed when you open the box up. Make sure all your transmission rates match up properly. Sounds like there may be a baud rate that doesn't match. Otherwise, try emailing techsupport@sparkfun dot com with your set up and examples of the data you're getting back. They'll be able to assist you further. If I have one as master sending serial data, how many clients can I have listening at the same time? As many as you can afford. Seriously though I don't think there is a limit and if there is its at least a few thousand. Does anyone know how noise/interference immune these modules are? I'm wondering if these 2.4gh modules would work onboard an RC plane operated from a 2.4gh transmitter. 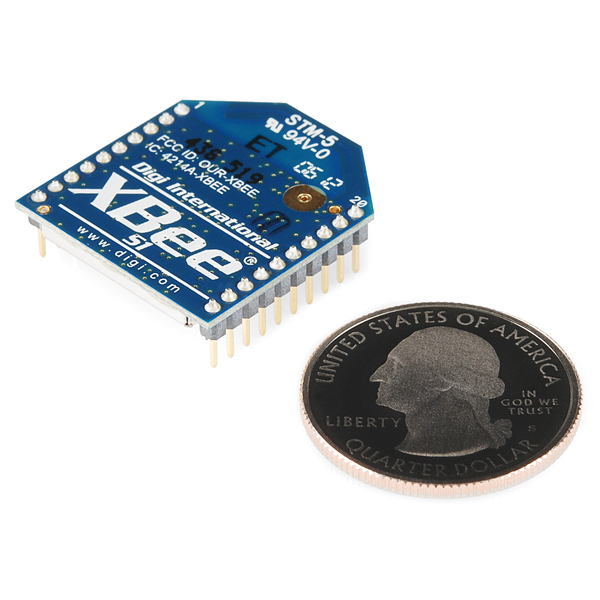 The RC plane transmitter is designed to be capable of interference free operation along side other RC transmitters of the same type but I'm not sure if these Xbee modules can also handle that environment. Anyone have any experience with this? Don't know about an RC transmitter, but I did have a lot of trouble once when I tried to run these next to a wireless router. It can only be set to 115200, why do you say the max data rate is 250kbps? When I use X-CTU, I can my Xbee OK. I want to add a name to my XBee, I can't find where add the name. Any Help?? 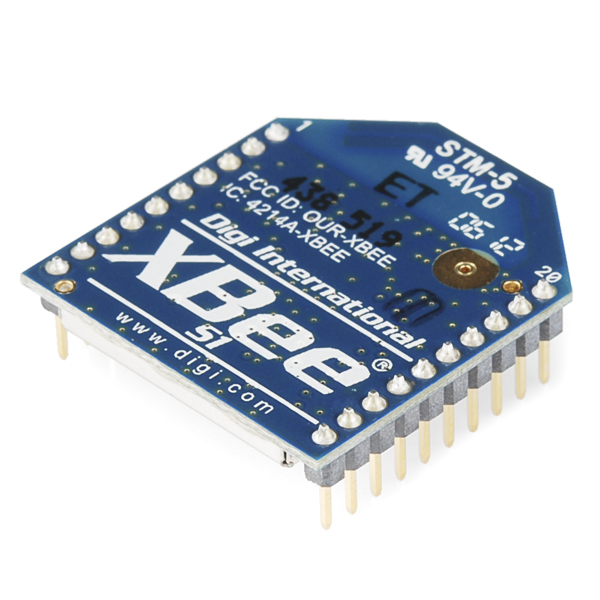 hello to all does this xbee its the same that the one that have the blue chip antenna on it?, if i have one with the blue antenna could interact with this with trace antenna as well?. or not? Do I need to buy the "Xbee Explorer" for it, since it is written in the guide "they don't need to be configured"? I bought the Xbee explorer USB and have a project that works well with Arduino. When I Serial Monitor, Xbee USB explorer automatically opens the Serial COM port lights and lamps Rx and Tx. When you step into the LABVIEW the door does not open automatically. Help me please it is urgent! Would this work with a Polymer Lithium Ion Battery which is 3.7 volts ? 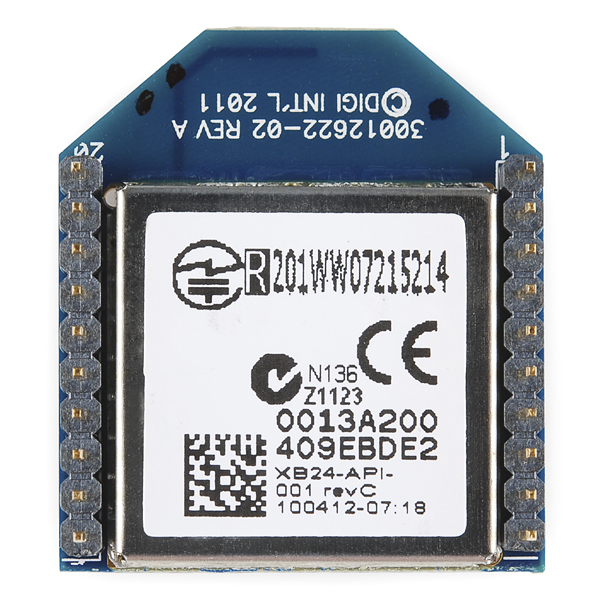 Hi, please i wanna know if i could build a zigbee mesh topology with those XBEE's serie 1 cause i need to set up a wireless sensor netowrks and i have only nodes with this specifiation; (I mean XBee 1mW Trace Antenna - Series 1 (802.15.4) ) ?? Hey, I bought a couple xbees from you and actually received two different ones...one being this model and one being the model that it replaced. I am trying to set up the XbeeSerialEcho tutorial you have but I can not get it to work. Are the two xbees compatible still? Somebody know if i can communicate one xbee pro series 1 with one normal xbee 1mw trace antena Series 1 ? Yes, any Series 1 modules should be able to talk with any other Series 1 module regardless of antenna type or whether they are regular or pro modules. I would like to buy WRL-08664 but out of stock should buy this instead of it? is it possible to get the US version to Aus? any way we can solder on a wire antenna? XBee as product is excellent!!!! There is a learning curve involved to configure Xbee, once you know how to configure you are good. Not very clearly documented on xbee website that VREF is must if you want to use gpio as ADC. I placed two orders, total of some 10 Xbee modules from spark fun. Their shipping and ordering system is not mission critical. The two day shipping I paid was not shipped on time. I have heard similar stories from many of my friends at work. I have been able to get two XBees communicating when both are plugged into a computer running XCTU (one on a USB explorer dongle one on an Arduino running an empty sketch). However, I have not been able to get the Arduino itself to interact with the module. It sounds like you needed to upload a serial passthrough code https://learn.sparkfun.com/tutorials/xbee-shield-hookup-guide#example-communication-test with the Arduino in order to get the XBees functional. The Arduino needs commands to know what to do with the XBee. For more information, try checking the documentation or contacting support if you still have issues. Downloaded the XCTU program and configured two modules using the software and neither would talk... Nothing in the software works. set both PAN ID to the same number, set on to Cooridator and no way to set the second to Router. only have end point. I have three of these useless pieces of crap. Hi, I tested some modules in the new XCTU and everything was working well for me. I would recommend checking out some documentation on configuring the Xbees. It may be that you are making a mistake in your settings/configuration. Two nodes working out of the box as simple as plugging them in. They passed serial data without any additional configuration needed. Before you go playing in settings I'd strongly suggest testing them to see if your setup of other hardware is correct. Once you have them working then start playing with channels and addresses so you know any issues after that is your configuration. I've worked with numerous radio solutions and these by far are one of the easiest to use. The only real downside is the price, but with the ease of use saving time things balance out.